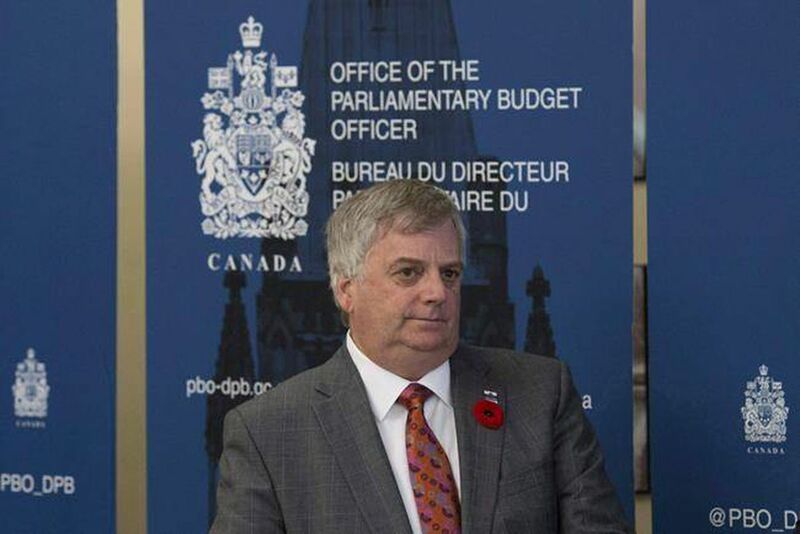 Parliamentary Budget Officer Jean-Denis Frechette is seen before speaking with the media, in Ottawa on November 1, 2016. Federal tax revenues from new income-sprinkling rules for small businesses could be about twice as much as Finance Department projections, states a new report from Parliamentary Budget Officer Jean-Denis Fréchette. Measures to restrict the use of income sprinkling by incorporated small businesses went into effect Jan. 1, even though small-business advocates said the federal government had not given them enough time to prepare for the new rules. The stated goal of the changes is the ensure that income sprinkling – also known as income splitting – is used to compensate family members for actual contributions to a small business, as opposed to being used as a way of paying less tax. PBO officials conducted an in-depth review of anonymized corporate income-tax returns filed by incorporated small businesses and personal income-tax returns of their owners. The report also analyzed T4 slips to review employee salaries and T5 slips to study dividends issued by the businesses. The report concludes that the new tax measures could be expected to bring in $356-million in 2018-19 – compared to the Finance Department projection of $190-million. The PBO says the amount will rise to $429-million by 2022-23, in contrast to the government's projection of $220-million in new revenue that year. The PBO acknowledges that such projections are highly sensitive to a wide range of assumptions. The report presents two alternative scenarios. One would see new federal revenue of $262-million in 2018-19 – which is still higher than the Finance Department projection – while another scenario would produce $659-million in revenue, which is more than three times the government estimate. The PBO's preferred scenario notes that the provinces would also generate an additional $233-million in tax revenue in 2018-19 as a result of the change. Dan Kelly, president of the Canadian Federation of Independent Business (CFIB), said the changes are a major concern for small-business owners who fear the new rules are confusing and will lead to future problems with the Canada Revenue Agency. "The PBO report confirms much of what we've been saying all along, that Finance is vastly underestimating how many businesses may be affected," said Mr. Kelly after reviewing the report. "The PBO shows that these new measures may bring in double or triple the revenue estimated just days ago in the 2018 budget. Second, the PBO report reveals it is nearly impossible to figure out who will be potentially affected. If Finance and the PBO struggle to figure out who will be hit with higher taxes, God help us when this hits the CRA." Income sprinkling was one of three main elements of a controversial package of tax changes first proposed by Finance Minister Bill Morneau in July 2017. Another aspect, related to the treatment of dividends and capital gains, was abandoned in the fall. A third element related to restricting the use of incorporated small businesses as a vehicle for making passive investments has undergone several alterations since it was first proposed. The latest version was announced in the Feb. 27 budget. The government's passive investment changes were generally viewed as an improvement, according to critics. Mostafa Askari, the deputy PBO, said it is not entirely clear why PBO's estimates are at odds with the Finance Department's. He said the main reason appears to be due to the fact that the PBO relied on a more comprehensive database to reach its projections. He said another theory could be that the government adopted conservative revenue estimates because of the considerable uncertainty over how individuals might change their behaviour in response to the new rules, which could affect the amount of tax revenue raised. Speaking to reporters in Halifax Thursday, Mr. Morneau said his department relied on tax data to produce the revenue estimates in the budget. "We've done a careful analysis of what the changes in taxation will result in from a federal revenue standpoint," he said. "We of course will continue to look to make sure that they're accurate over time, but they are our best estimates." The PBO report provides a detailed look at the number of families that are likely to be affected. The report estimates that about 32,900 families will be affected. More than 90 per cent of the additional federal tax revenue would come from families with taxable income of between $150,000 and $1-million. The $356-million in new federal revenue raised works out to an average of $10,820 per family. Including provincial taxes would raise the combined average tax hit to nearly $18,000.